If there’s one place in Italy where I can enjoy a golden day time and time again, it’s the small town of Amalfi, the namesake village of southern Italy’s Amalfi Coast. With its stunning natural setting, colorful architecture and beautiful beaches, it’s easy to fall in love with the Amalfi Coast, and it fills my heart with joy and a deep feeling of gratefulness to call this beautiful coastline in Italy home. 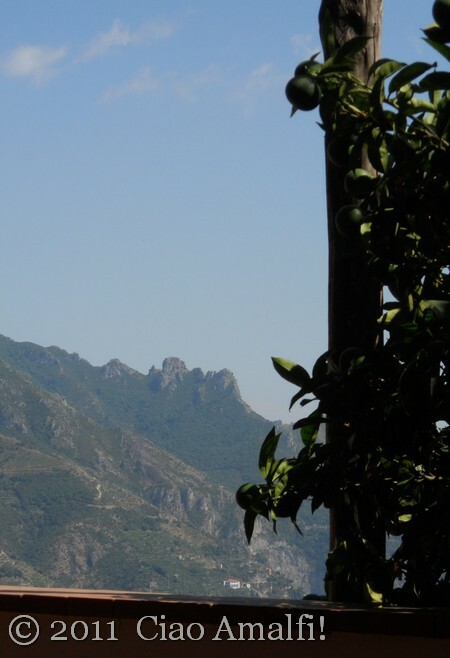 While I love each little town and village, I lost my heart in Amalfi, somewhere amid the winding medieval staircases and the terraces of lemon groves. Come along as I share with you some of my favorite things to do on a Golden Day in Amalfi! Start your day in the heart of Amalfi in the Piazza Duomo, where you’ll find many choices for outdoor cafes to sit and watch the morning hustle and bustle – small delivery trucks bumping along the cobblestones, locals out doing the daily shopping and kids hurrying to school. This morning routine takes place before the backdrop of one of Italy’s most colorful and striking churches, the Cathedral of Sant’ Andrea (St. Andrew). 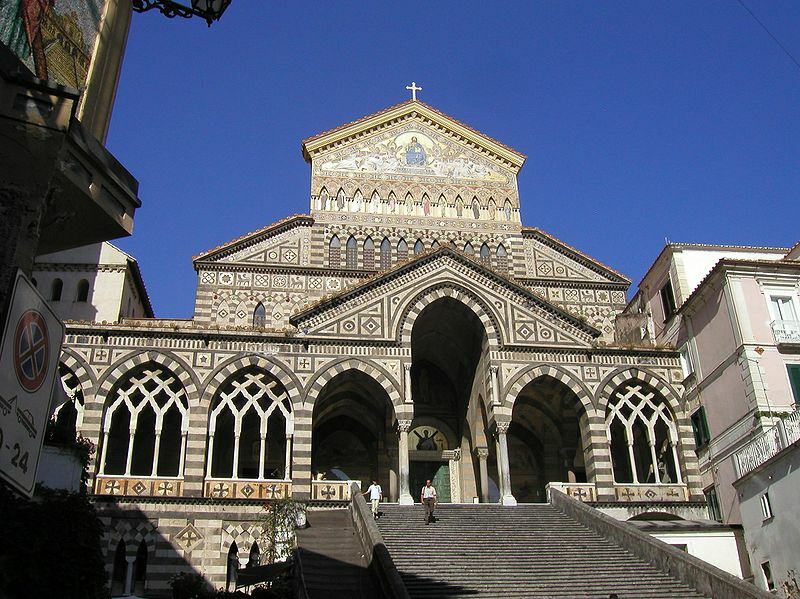 Climb the grand staircase to visit the Cathedral, also called the Duomo, where for only a few Euros you can visit the 13th-century Cloister of Paradise, with beautiful views of the Duomo’s bell tower, the Cathedral Museum, the crypt of Sant’ Andrea and the beautiful nave of the church. If you’re visiting at the end of June or late November, plan on staying for the Festival of Sant’ Andrea, one of the largest religious celebrations on the Amalfi Coast. 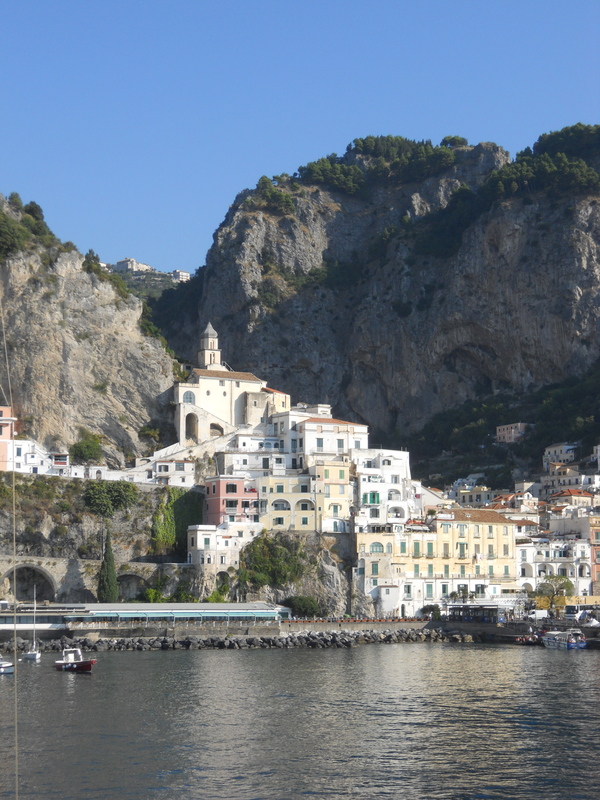 It’s a wonderful opportunity to experience the deep traditions in honor of Amalfi’s patron saint. Follow Amalfi’s main street lined with shops, restaurants and cafes that leads from the Piazza Duomo all the way to the top of the town. 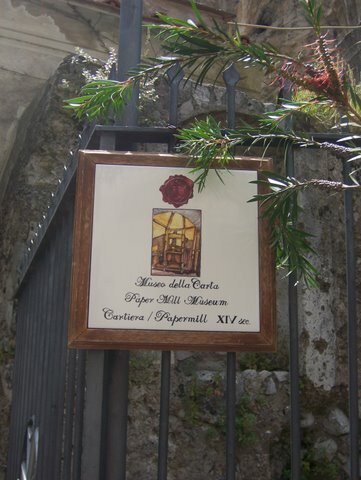 Near the top you’ll spot the entrance to the Museo della Carta, the Paper Museum, where you can take a short tour to discover the history of papermaking in Amalfi. 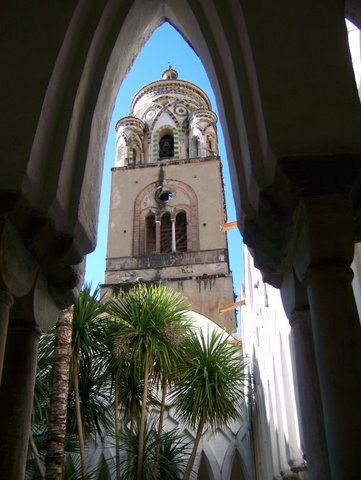 On your way back down toward the center of town, head off the main street and explore the medieval passageways. Just be prepared for steps! Now it might be time for a little something sweet, and one of my favorites is the artisan gelato made at the Café Royal just steps from the Piazza Duomo. Try their unique homemade flavors like Passione degli Dei (Passion of the Gods), a delightful combination of lemon, strawberry and a touch of champagne. Best spot for enjoying your gelato? Climb up the steps of the Duomo and claim your own spot to enjoy the view. Lunch overlooking the harbor of Amalfi from the terrace of the Ristorante Marina Grande is a real treat, and worth the little extra splurge. 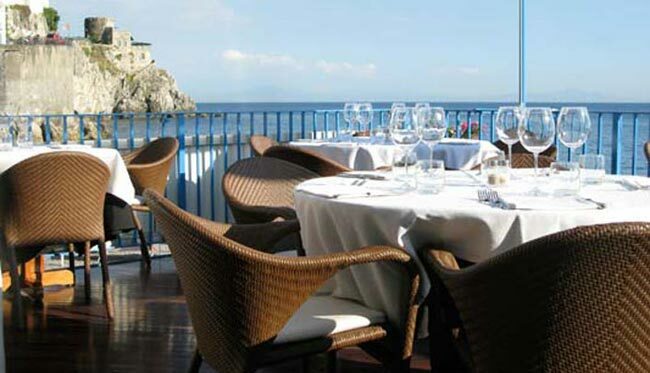 The regional specialties of the Amalfi Coast are handled with such delicacy and creativity, and the setting is lovely for lunch or dinner. 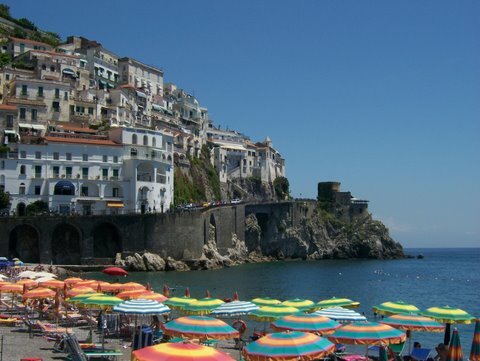 After lunch, enjoy a leisurely passeggiata in Amalfi along the harbor to the end of the port. This is the traditional walk in town, and you’ll spot many locals out in the afternoon and evening enjoying the views and catching up on the day’s news with family and friends. As the sunlight begins to fade behind the mountains, head toward the Bar Gran Caffè overlooking Amalfi’s Marina Grande beach. Find a spot at one of the outdoor tables and enjoy an aperitivo as the sunlight turns to pink and purples over the harbor of Amalfi. It’s the perfect spot to end a Golden Day in Amalfi, with the sounds of the waves washing the pebbles back and forth on the beach and the beauty of Amalfi all around. 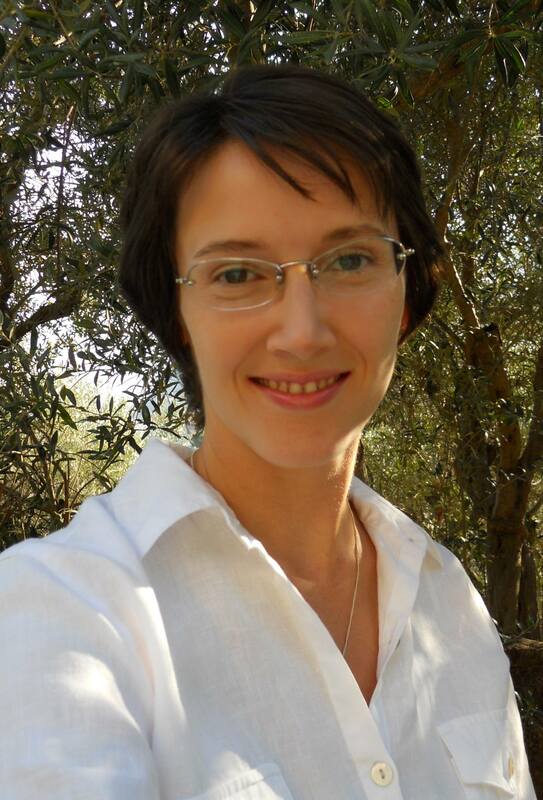 Grazie for this dreamy day Laura!